What is the Last Pilgrimage? The Last Pilgrimage is not a ministry, it is a movement. The path a Christian takes in their journey to God's kingdom, is a pilgrimage. One where they must eventually leave all they know behind and walk the narrow way, through the eye of the needle, which strips you of every spot of pride, blemish of sin (thoughts that have their Source In Negativity), worldly desires, concerns, hopes and dreams. As many of you are aware, we are in the last days. However, we are actually at the final countdown and God is calling His people out of the world, to be made ready for the rapture. Yes! You must be made ready for the rapture, for when you are raptured, you will experience His supernatural power and presence, beyond belief and your wildest imagination. Like the Israelites, when they left Egypt, you must step out of the world and be cleansed of all sin, pride, worldly thinking and desires. There is strength in numbers and many hands make light work, in more ways than one. If you have been taught truthfully by your Pastors, then you will know, that in order to enter God's presence and His eternal Promised Land, this must happen. God is absolute love and His eternal kingdom, is the supernatural realm where all who are therein, dwell in His presence of absolute love and virtue. He will not allow anyone to enter His presence or His realm, unless they have been thoroughly cleansed. Because He will not allow Himself or His kingdom to become polluted with the nature and characteristics of sin, pride, worldly thinking or the desires of the carnal heart. There is only one true desire of the heart and that is to be filled with absolute love, peace and joy, and only one, true will of God and that is to fill our heart with absolute love, peace and joy, and only the living God of absolute love can fulfill the desire of our heart. Every word Jesus spoke was absolute truth. Do you know why He said this? Because the sinful nature of Satan is the survival instinct of the flesh and everything He did, was to show you what it means to be a child of God and to live for love and not the survival instinct. Yet here you all are, safe and sound in your comfort zone, living to survive in "the world" and not realizing that you are not the servants of God you think you are, but the servants of Satan, the sinful nature of the survival instinct. Jesus made the ultimate sacrifice, by being crucified. Because thousands had been crucified before Him and it was a known fact, that nobody survived crucifixion. He did this, so that there would be NO DOUBT, that He had died and had risen from the dead. You are blind to the fact, that you must also take up your cross and crucify the flesh, by forsaking all and overcoming the survival instinct of your flesh, the sinful nature of Satan within you and until you truly do that, you are not His disciple, merely a wannabe. Over the centuries, "the church" has increasingly compromised, until now, living for God has come down to a few hours on Sunday and even then, you cling to your money, from the fear for your survival and spend the rest of your time living for your survival in "the world" and your creature comforts. You have no idea of how much "the church" has become an offence to God and just how very short you all fall. Which is why He is sending His spirit of wrath, the nature of absolute fear, to chastise and correct. To those who serve God, in His eternal realm, there's nothing to fear, but fear itself. His wrath is not anger, but the nature of absolute, terrifying, paralyzing, petrifying, dreadful, frightful, gripping fear and the reason He is sending the nature (spirit) of His absolute fear upon all flesh, is so that all will know that He is all powerful and you will all know, beyond the shadow of ANY doubt, that you are being gripped and shaken, by the living God who created all natures, including man's and if you manage to survive after it has come upon you, then you will truly know that there is absolutely nothing to fear, but fear itself, the absolute fear of God. Lot's wife is the example, for with just one thought she couldn't resist, she looked back to the world she knew and to the comfort and things she left behind, and the nature of fear (spirit of wrath) came upon her and filled her with such absolute, paralyzing, petrifying fear, that she died standing where she was, literally frozen with fear, for His wrath is without mercy or compassion and listens to no excuses. As for me and those who march with me and are truly cleansed (debrainwashed) of this world and all it's ways, and are without a spot of pride or blemish of sin and haven't the slightest worldly thought, desire or concern, and walk in the spirit (nature) of His true love's holiness, peacefulness, gracefulness and graciousness (Holy Spirit), with true equanimity, humility and cooperativeness (brotherhood), without a care in the world, like little children at heart, well, let's just say, my chariot awaits. The only ones who will be "passed over" by His wrath and experience the rapture of His absolute love, will be the true disciples, who have come out of the world and been cleansed of every spot of pride and blemish of sin, and have overcome their survival instinct and live for God with all their heart, mind, body and soul, in the spirit of His true love's holiness, peacefulness, gracefulness and graciousness (Holy Spirit), with true equanimity, humility and cooperativeness (brotherly love), without any part or care in the world. You can cling to your worldly possessions, hopes and dreams, and long for your creature comforts, but I warn you, those who have any part of the world, will experience the wrath. No doubt, there are many of you who've been hearing the Holy Spirit within you, telling you this time would come and to be prepared. Many see it as an end-time revival, a last crusade or an exodus. Don't be blinded by your pride or doubt, God is giving you the opportunity to be thoroughly cleansed now, the easy way, while there's still time. Otherwise, those who aren't will have to do it the hard way, through the great tribulation. Though we will undoubtedly witness God perform awe-inspiring miracles, the power is His, not ours and His Holy Spirit is not a street magician. He is the spirit of God's absolute holiness, peace, grace, humility and brotherly love. These are the things you should seek from Him, not power. The power will come, when you are walking in His spirit. You must understand, that God is the supernatural power and presence (nature) of absolute, undying love and that the Christ, is the character that is manifested from the characteristics of His true love's absolute virtue. He is the great I AM, the watcher that watches the watcher within and is within every soul who gives their life to Him. How much, depends on how much you're willing to surrender and allow your every thought, word and deed to be governed and dictated by absolute love. However, when we are all completely surrendered and dwelling in the power and presence of His almighty love, then we are supernaturally transformed into the character that is made manifest from His characteristics, the character of absolute, majestic virtue and in Him, we are all made equal. Do not think of yourself, according to the way the world perceives people, for it is ruled and governed by the sinful nature and the pride of self. You are a child of the living God and all you need, is to have humility and courage within yourself, confidence in Christ and faith in God. If you have these, then God can use you in ways you haven't even begun to imagine and everyone has skills they can share. This is not a ministry. There are two I's (eyes) in ministry, no I's in movement, because all our eyes are on Him and it is God's will, so it will come to pass, whether you're ready to be a part of it or not. It's up to you. In the words of Smith Wigglesworth, this is to be "the greatest move of God in mankind's history". It is unprecedented and without comparison. It's meant to be that way, for God intends for it to be the revival to end all revivals, the crusade to end all crusades, the harvest and sorting of the wheat from the chaff, the true from the false, all rolled into one and only true believers will have the humility, courage and faith to leave the world behind and participate. God wants us to leave the world behind, along with all the religious traditions. He wants to tear the walls of the church down and bring it back to its foundation, its grass roots. As for the world, well, sorry mate, we just don't care. It's not the true way of eternal life. We've got higher thoughts to share, in an atmosphere of absolute love, virtue, grace, humility, holiness and peace, in a realm rich in the supernatural power and presence of God. We are in the process of establishing a base of operations at this stage and so we're hoping to gather people and resources to help get the ball rolling. We will need people with skills, teachers, nurses, cooks, bottle washers, etc. An army marches as one body, made up of many different parts that have a function to perform, so the army remains efficient and well taken care of. It is not any one man and definitely not in this case. This is God's Movie and He is the author, producer and director. If everyone obediently follows the direction the Lord gives them, in the spirit of holiness, peace, grace, humility and brotherly love, then everything will flow smoothly, harmoniously and joyfully. If you cannot participate physically at this time, that's ok. You may be able to help financially and/or by spreading the word. Do not think of this as a ministry, but as a movement. This is the will of God and will continue until Christ returns, which is very, very soon. 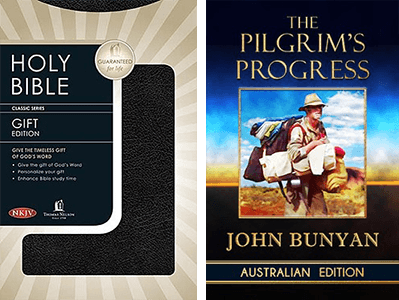 As we walk, we expect God to move through us powerfully and see many people come to Christ and we would love for each person who makes a confirmation of faith, to receive the gift of a Bible and the soon to be released Australian Edition of The Pilgrim's Progress, to help them understand that believing is just the first step, on a pilgrimage that will involve trials, pitfalls, sacrifice and watchfulness. But if they persevere, they will reach the destination and it's a lot easier with co-operation and mateship (brotherly love). Therefore, we are also seeking financial assistance in making this possible. Smith Wigglesworth prophesied, along with others, that this event would begin in Australia. There are many saints, whom the Lord has been preparing for this time, scattered around the world. We will get the ball rolling here and many will come from across the globe. Those who are from other countries will meet up with other people from their own country and together, they will return and continue the pilgrimage there. So don't fret if you can't make it to Australia, it will come to you. However, God is not wanting prayer alone with this. He doesn't want us to be talkers only, but doers. So those who can, should. Actions speak louder than words and he who hesitates, will be left behind. God knows who hesitates, from fear, doubt or pride. Who Is The Last Pilgrimage For? The Last Pilgrimage, is for those who believe in God, Christ and His eternal realm (God, King and Country), in which everyone's life is governed by the power (nature) and the glory (characteristics) of God's absolute love and virtue, as it manifests within, through and from us, in the spirit of absolute holiness, humility, cooperation, peacefulness, graciousness and brotherly love. When we are walking in His spirit and follow the direction His virtue sets for us, in the course of a life that is living for His love, then who does what and anything to do with what is, is no longer a concern, as we move from seeking what we want to be, to seeking how to be the best we can be. We then discover, that the the best way of how to be, according to the way of life in the holy spirit cooperatively, is to be absolutely virtuous at all times and the spirit leads us, by whispering in our ear, "be gracious", or "be humble", or "be honest", or "be generous", or "be forgiving", etc. Australia is the new and sunlit shore, the Great Southland of the Holy Spirit, the island continent set apart from the rest of the world, that God has chosen for this almighty move of His power and glory. To call the true believers, who are genuinly seeking the true way of life in the kingdom of God, to step out of the world and up to the highest ground, altogether and all together. Our ultimate goal, is to one day come together in a global gathering, in the holy spirit of the Lord and in one accord, on the ground and not in the cloud. We believe that we are citizens of the kingdom of God, not of the world and we behave accordingly toward one another, with graciousness, humility, equanimity, cooperativeness, courtesy and respect. We are all pilgrims, seeking the true way of life in God's Holy presence of absolute love and virtue. So let's be more co-operative and gracious toward one another.